No pictures today because: a. I haven’t taken any. b. I’ve gone over my bandwith allottment by about 5 times this month. I’m fairly computer savvy, but know aboslutely nothing about bandwith. Does posting a lot of pictures have anything to do with that? Up until a few weeks ago I wasn’t resizing my pictures, assuming TypePad did it for me, but I could be wrong. I am such an ignoramus in this area. Anyone out there who knows, please feel free to comment and let me know what I’m doing wrong. I suppose I could call TypePad support, but so far they haven’t seemed to notice and I certainly don’t want to draw it to their attention. School started this week, so my knitting time is considerably down. I think my classes will be interesting, though. One is on the anthropology of linguistics. There’s some technical stuff at the beginning, but the instructor assures us that it will get more interesting later. She is a real hoot! In her lectures she makes chimp, cat and dog sounds and advises us that although one of the writers of our textbook is a “crappy writer”, he does have good points to make. She and her husband have written one of our required texts and she tells us that the best thing about this text is that it’s short! My other class is on the Sociology of the Family – a subject that is near and dear to me, so it will be interesting. 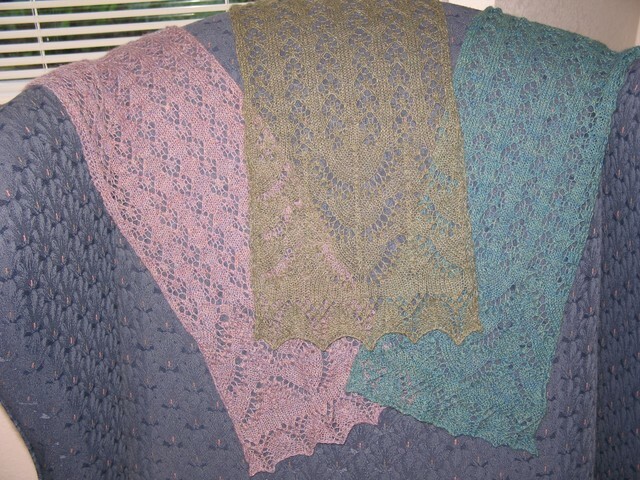 On the knitting front – thanks to all who offered advice and suggestions on Lily of the Valley. I still frogged it. There was just something about it that didn’t hold my attention. I’ve never been afraid to cut my losses. I really do have to love a project to invest that much time in it, and although I love the look of the finished project and the pattern was lovely, it just wasn’t meant to be at this time. Maybe another day. 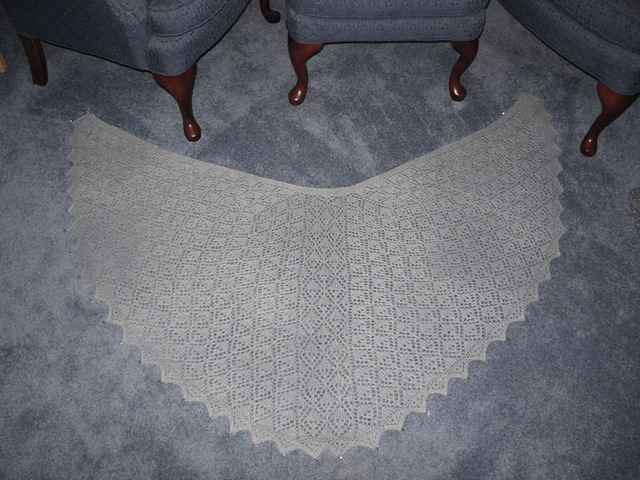 But I have started Madli’s Shawl from Interweave Knits and think this one just might make it. It still has nuppage, but not on every row. The pattern doesn’t seem quite as easy to visualize and/or memorize, but I’ve only done one repeat so far. And, in my constant quest for rationalization, this does not count as a new project, since I frogged the other one. I know, I know, as Debi so kindly pointed out, the knitting police are not going to come arrest me for starting something new. But with my current schedule, I need to keep things simple to avoid stress – and too many things on the needle definitely causes me stress, albeit of my own making. Tomorrow – quality knitting time! My husband and I are going on a road rally. He drives, I knit, we both eat out. A perfect combination! I can’t say enough good things about the Silky Wool. It is warm (yes, I needed it this morning), lightweight and just plain nice! I love this shape too because it stays on without a lot of fiddling. 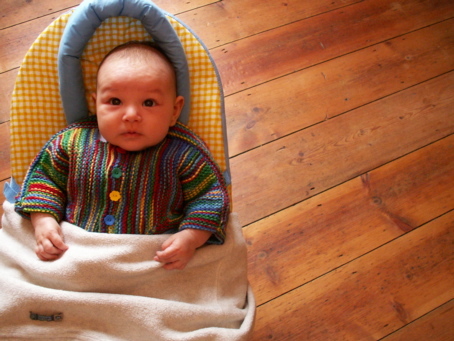 I can’t say it was the most interesting knit in the world – it got kind of boring, but I will definitely do it again. 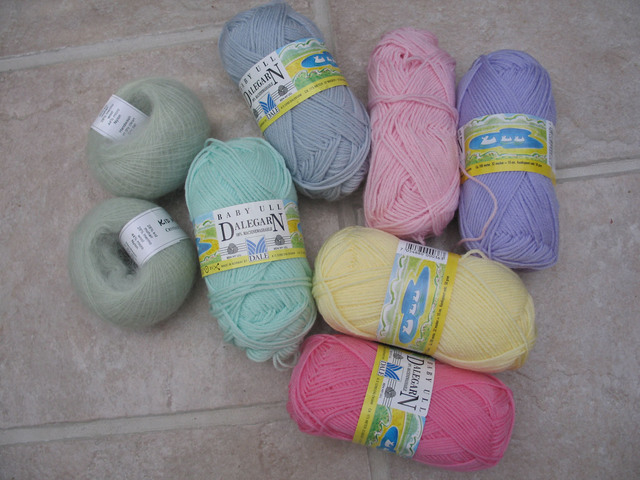 I’m thinking about some of the Knit Picks DK or sport weight wools. But not yet – I’m trying to be good and not start new things. The exception is Izzy’s Christmas sweater, which I started yesterday. I haven’t decided yet if I’ll post pictures. It would be nice to be a surprise, but if all goes well, they may be here in a month or so and I’ll have to knit in front of her parents or it will never get done. So stand by for pictures, perhaps at a later date. The nupps are fine, but those parallelograms on the left side of the picture are supposed to be diamonds. I finally decided that this is not a quick and easy knit and if I’m going to spend that much time on something, I just cannot tolerate those wonky diamonds. I’m not sure what I’ll do yet. I may look for another pattern for that section, because otherwise I love the way it’s turning out. And in closing, if you are Abby – TURN AWAY FROM THE COMPUTER. DO NOT SCROLL DOWN! (Ben says these kind of things freak her out) OK, ready? Does anyone know what this cute little guy is? My neighbor found him in her driveway. I’ve looked through the internet and can’t find anything. I hope he’s not harmful because he’s munching away in our lavender plants. We couldn’t bear to destroy him. Please, please don’t tell me he’s some kind of wool eating caterpillar. It would break my heart! 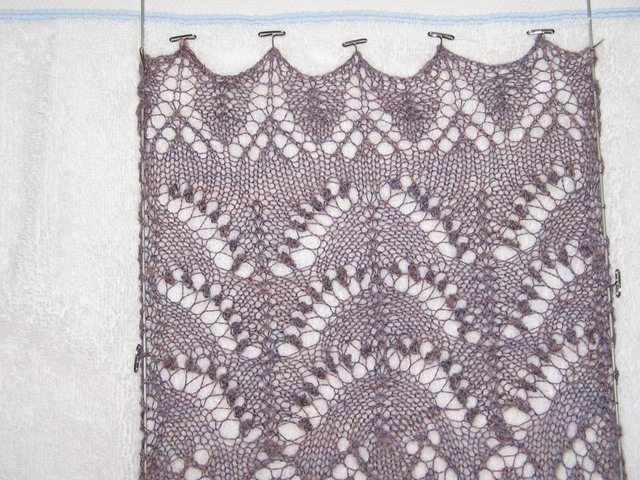 Good – Love the silky wool and love the shape – will probably be one of my favorite shawls to wear. 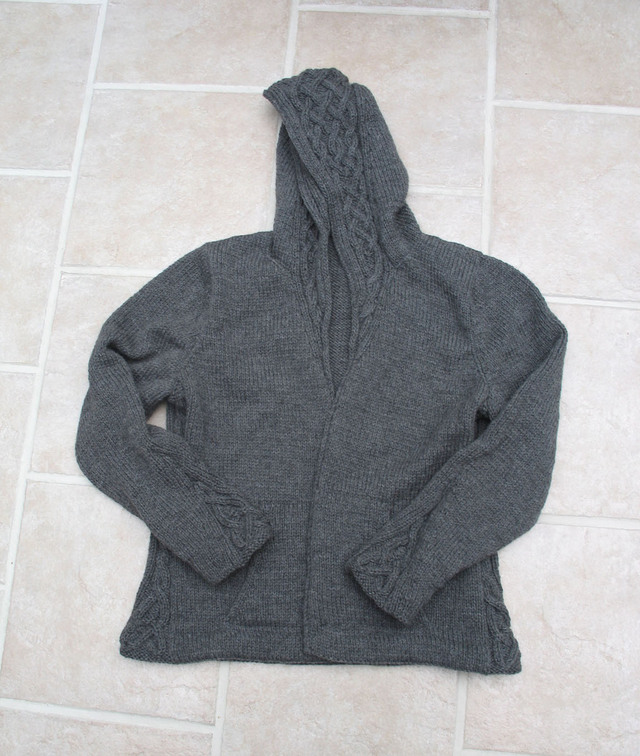 Fairly quick knit – started it on July 23rd, so it took a little less than a month. Relatively easy as lace goes except that I kept making mistakes on the first two pattern rows for some reason – putting yo’s where they didn’t belong and leaving others out. Then I started actually paying attention and things improved. Bad – Love the silky wool, but it hurt my wrists to knit – maybe because I was working on it too much? A little boring to knit – especially those long purl rows toward the end. 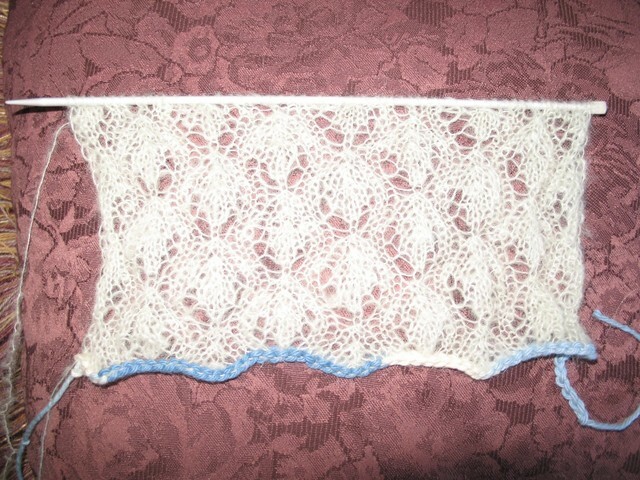 But I did not want garter stitch lace and was willing to pay the price. All in all – would I do it again? Yes, but not tomorrow! Next up – Rogue!! I received my zipper today and have it pinned in. Hopefully it will be on the blocking board (floor) by the weekend. Why, yes – that is Rogue! A little lumpy because she hasn’t been blocked yet, but she is all sewn together waiting for the zipper to arrive. I’m hoping it will come soon so I can sew that puppy in and have Rogue to wear when the weather turns nippy. And that’s not all. Following Debi’s sterling advice, I picked up the Barbara shawl and decided not to work on anything else until it was done. I am now knitting on the border! It’s going a little slower than I might hope, but I think less than a week’s work and it will be done. I’m sad to report, though, that the Crystal Palace Merino scarf has been discarded. Impossible to frog – so I just broke the yarn and threw it where it belonged – in the trash. Life is too short to work on something that gives you that much grief. After Barbara is done, I will probably return to the tried and true Estonian Scarf. My sister has already picked out the color of Alpaca Cloud she likes. Don’t get me wrong. I find nothing wrong in someone having a gazillion projects going at once. I’m just discovering that it’s probably not for me and that simplifying is giving me a real sense of relief. Here’s the latest picture of Izzy. Mum had to buy her a pink hat because everyone keep commenting on what a cute boy she was. No mistaking this for a little girl! See that blob? 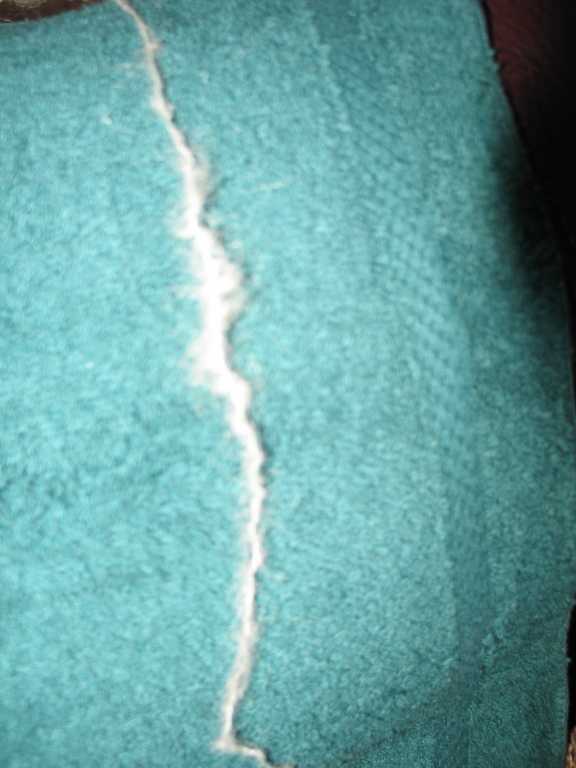 The fuzz on the mohair is traveling down the core as it slides through my fingers. I tried trimming the blob, but then ended up with a naked section of the core instead (no prettier than it sounds). I was assured by the Summer of Lace group that this is not usual with mohair, so I will reserve judgement. This, by the way, is Crystal Palace Kid Merino. I guess this is penance, huh? I made the decision today that I have GOT to stop starting new projects. Stop starting – is that an oxymoron? I realistically know that I will never be like Wendy and only knit on one project at a time. But I’ve gotten myself overwhelmed with projects and truth to tell, am feeling a little stressed out. I know it’s of my own making, but there it is! So I am pledging not to start another new project until one, and maybe two, are done. I also know that knitting pledges (unlike marriage vows) are made to be broken. But you have my permission (nay, my pleading!) to comment and castigate me severely should I break this pledge. 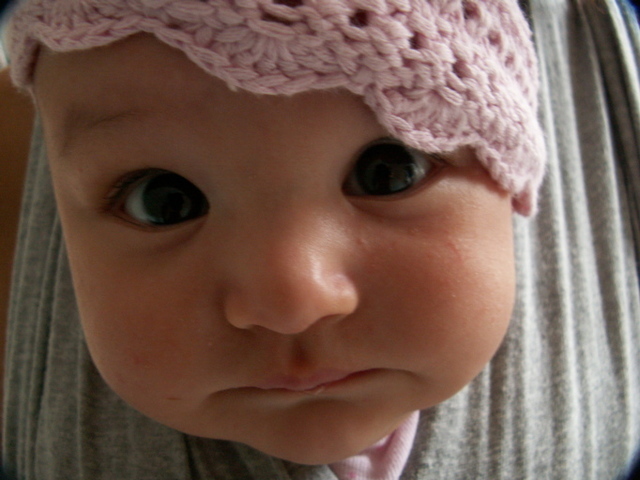 But have you seen the strawberry hat, and the cupcake hat and the flower hat and, and and . . . . Izzy’s head will be cold! We had a lovely time visiting and she was just as gracious and lovely as her blog. She seems to have recovered quite well from the wineglass incident and was knitting happily away on a sock. I also picked up some lovely pale green Crystal Palace Kid Merino to make my sister the Cocoon scarf from Fiber Trends. This is to make up for the fact that I outright lied to her by telling her in July that I would bring her birthday present with me when I came this weekend when in fact I hadn’t even bought her anything yet. Sigh! In my defense, she is getting darn hard to buy for because she has everything she needs and pretty much what she wants too. So my penance will be knitting mohair in August. However, if our cooler weather holds it may not be all that bad. Stay tuned! Is it redundant to say again how much I love this pattern? It has so many things going for it: It’s got a center section that’s almost mindless – eight rows that are easily memorized, a flurry of activity at the end with a little raised blood pressure with those nupps (I’m still not satisfied with them) and with the Alpaca Cloud, it makes a really inexpensive gift. Of course those of you on my gift list should not construe that I don’t care for you and am giving you a cheap present. I’m just thrifty where the yarn is concerned – there are many hours invested in this. And the end result is so ethereal and soft that I keep picking them up and just running them through my hands. I’ll wear them out before I gift them! I’ve started a third one, this one in moss green. This will be my trip knitting because I’m getting a mini vacation this week! I’m taking Thursday off and with my usual Fridays off, will have an extra long weekend! I start on Thursday by going to meet the Yarn Harlot!! I am too, too excited, but know when I meet her face to face I will either become a blithering idiot or totally speechless. Shall I take my Estonian Scarves to show her? I wish we could just take an afternoon and knit over coffee, but I’m sure I’ll be one of a mob waiting to meet her. After that, my sister and I will go to the Seattle Street of Dreams and drool over million dollar houses. I will take my camera in the misguided hope that I might find an idea or two that I could actually afford to incorporate into my humble domain. Some of these houses have kitchens that are larger than my whole house! On Saturday I’m attending a scrapbooking seminar, the highlight of which is a class on using Adobe’s Photo Impression (my photo editing software). And we end the weekend on Sunday with a trip to the Acorn Street Yarn Shop (my favorite yarn shop in the whole world) and a visit to the Pacific Science Center. Whew – I need a nap already! I am so looking forward to the break in routine and a nice visit with my sister.